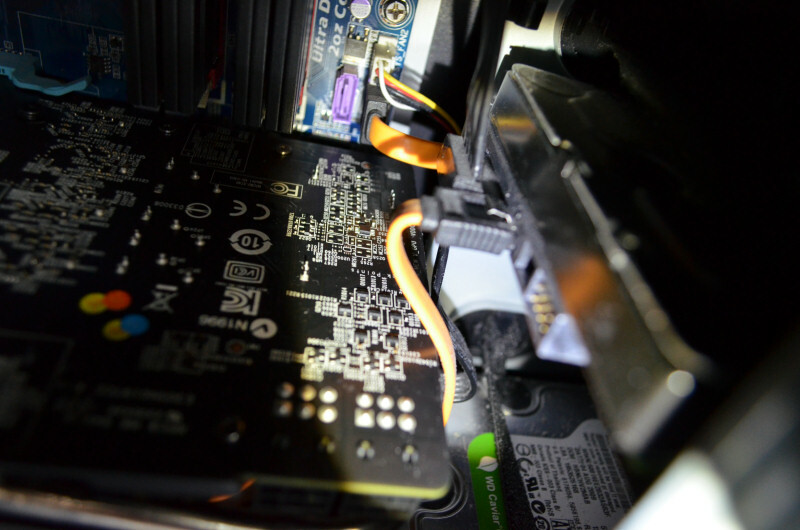 MSI is known for its quiet TwinFrozr IV cooling system. Do you use more than one monitor? MSI's Gamer edition has a quieter fan profile than the Hawk. I tended to have a pretty bad experience in the past with cards that haven't yet been vetted by SPCR or Techpowerup. Other sites are extremely lacking in noise measurements and user reviews on sites like newegg saying the cards are "quiet" don't really mean anything. <shrugs> In general, Hawk is tuned for higher clock rates/voltages than the Gaming part and MSI runs the fan profile at a higher/faster level. In specific, I haven't seen both tested by the same review site - so, no apples/apples comparison. Well there is this vs this. Just wondering if its a safe bet no matter what the gpu is. Well the 280X also produces more heat overall. I was mainly wondering whether the Gaming edition would always be quieter than respective Hawk/Lightning edition for the same GPU. At least from the example in the links I posted, it would seem so. If it is the case with the 270X, with the HAWK already being pretty quiet overall, hopefully the Gaming edition would be pretty close to SPCR standards. Here's the gaming edition of the MSI 270X (scroll down to it) it's very quiet compared to the other 270X's in the review. The gaming edition R9 270X fits in the Antec Solo if anyone is interested. There's roughly a 2-3mm gap from then end of the card to drive cage. The defeault 18% fan speed under windows is very quiet and only gets louder between 25-30% with the side case open. Wth the case closed the heat built up (in my case) and pushed the fan speed closer to 35% which is still pretty quiet with no noticable annoying whine (I'm comparing this to a HD4850 with accelero S1 + 900rpm Nexus 12cm fan). GPU temps rose to low 80's (I think 99 is the max). I think a bigger case or a case with better airflow, temps would be lower keeping the fan speed between 25-30%. * used Furmark for the stress test. For an out of the box gfx card it did an excellent job considering it only takes two slots up. My HD4850 + accelero + Nexus takes 4. If your budget will allow I think you will be happier with the MSI Twin Frozr IV GTX 670. It is 270 instead of 230 for the MSI Hawk r9 270x but you also get assassins creed black flag and splinter cell blacklist with the gtx 670. If you look at it this way, MSI hawk r9 270x (230) + Assassins creed black flag on steam (60) + splinter cell blacklist on steam (60) = 350 dollars vs GTX 670 (270) and both games FREE the 270x ends up being 80 dollars more expensive if you look at it from this angle. The GTX 670 is only a tiny stones throw away from the performance of the gtx 680/gtx 770. It basically sits in between the gtx 760, which it is more powerful than, and the gtx 770, which it is very close to performance in. Basically a maximum overclocked gtx 670 can equal the performance of a stock clocked gtx680/gtx 770 and even exceed it in some cases. It's a very good price/performance ratio card. The GTX 670 consistently outperforms the r9 270x to varying degrees. Sometimes the difference is only 4 or 5 fps but other times it's 20-30 fps (or even more) faster but at every single game used as a comparison the gtx 670 was always the winner by some margin even the most radeon optimized game the 270x still loses to the gtx 670. Even with the higher performance of the GTX 670 power usage is virtually identical. Some situations the gtx 670 uses more and some the 270x uses more, it's basically a wash. Same thing with the temps as well. Since both cards use a similar twin frozr setup with similar fans they are both quiet cards. Since nvidia is just able to offer better performance with more efficient use of its power you get more fps and higher performance without a power or noise penalty. I hope I successfully made my case to you. I'm positive that extra 40 cash will be well worth it. And I'm not sure how the free games are distributed but you may even be able to sell off your download codes for the 2 games on ebay. Since the games are selling for 60 on steam if you put them up for 40 each they would sell in no time so now you only pay 190, 40 dollars cheaper and better in every way. I don't see how you can still choose the 270x over the gtx 670 after hearing all these facts. Good luck with your purchase, I know you will do the right thing. The GTX 670 even has an answer for cards that must fit in a tiny space. the mini itx form factored Asus DirectCU mini GTX 670. Now obviously this card will not be as quiet as the exceptional twin frozr IV cooling system from MSI. Making a card so compact has limitations. But if you really need power in a compact space this thing has no equals. Just doing a quick look the same site has the msi gaming 270x that you see in these pics rated at 28db and the asus direct cu mini rated at 32db. So it is a bit louder but it also has more performance. The difference in noise may not be as large in a smaller case where the 270x has no room to breathe and barely fits. Since the directcu mini is so small it leaves it more room to breathe which may allow the fan to be slower. And for the die hard quiet enthusiasts you could force a down clock on the gtx 670 mini just enough of a down clock to still give you equal performance to the twin frozr 270x but since the gtx 670 is down clocked you should be able to get adequate cooling with a slow enough fan speed to eliminate any noise differences between the 2. You can fit this card in even smaller applications than this antec solo setup if need be plus pull more performance at a slight noise penalty or down clock and under volt and pull equal performance at about equal noise levels but have the added ability of fitting in almost any mini itx box even ones much smaller than the solo. I've been looking at the 270X as well in order to replace my Scythe Musashi cooled 5850 but the argument for the GTX 670 is rather compelling. G Sync alone is pushing me in that direction and never mind the current game bundles or lack thereof. I just hope that if the technology really does take off that we won't be limited to just the one vendor. AMD's Mantle could be really impressive, more information about it should appear at the next APU tech press meeting (which I think is this week). For me, letting developers get the most out of a card through a very thin driver layer is the best software based improvement in years for the PC. The first sign of what it could deliver will be from DICE's BF4 update in December. Just to confirm you were able to get the below 260mm card in the original Antec Solo!? First off: Where are you getting a GTX 670 with a respectable, silent, cooler for $270? I know the ASUS coolers, as reviewed by SPCR are up to snuff, but they're 323$ on amazon while a MSI R9 270X is 200$ on Newegg. It's a completely different price segment. Also, it's foolish to value the games at 120$. Assuming you even want to play the games in the first place, their running price on ebay is 10$, simply because of the fact that so many are available because so many people don't want to play the games they got through their Nvidia card. And even if you valued the games at an absurd amount above their actual value, the AMD cards come with their own game bundle as well. However, when you're on a forum valuing silence and power consumption, I think the small game bundles should be an afterthought compared to the noise/power consumption/price of the card. I'm not saying the 670 is bad, but it's a completely different price segment. It's kind of pointless and foolish to compare the two and say that the 670 is strictly better. If you want a 16% performance gain and a proven, SPCR appraised cooler for $123 more, go for the 670. Otherwise, get the R9 270X. Just wondering, I've seen in a review that the Hawk can achieve in idle a 700 rpm which is very low. Sorry for the late reply - Yes it was in the original Antec SOLO case. 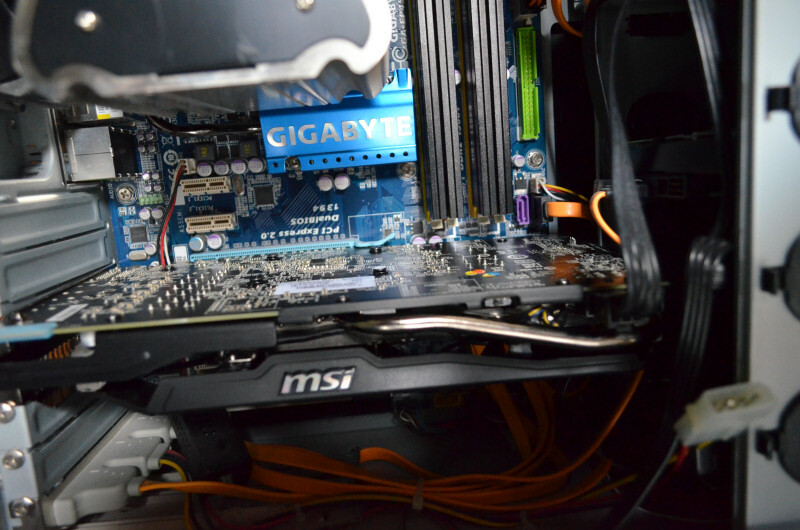 I'm looking at the MSI 270x Gaming 2GB card as well. To replace a HIS 7750 silent. How is the card during idle? I would say quiet, but FAR from being silent: at which distance do you sit from the PC? If you're refering to the Gaming edition I would say it's very quiet at idle, unless your room is an anechoic chamber you won't notice it imo. If you have your mid-tower in front of your nose, like I have, you will notice it, easily, while you can't notice a passive card (like the one he's used to have). Definitely the PC placement does matter, this is why I asked for. I doubt anything but passive would be audible if the PC was that close. Your case will also make a difference. In a fractal design 4 it was not audible at idle with the case on the floor (again I'm refering to the gaming edition and not the hawk). The Solo II is on the floor. When I said "idle", I actually mean watching blu-ray and movie files as well. Noticed that the HD7750 did increase the clock speed during videos, although there was no fan to ramp up. Not sure whether the 270x behaves the same way. quest_for_silence: You have the 270x Gaming? Yes, more or less it behaves same way. I've tested it against an ASUS GTX 660 DC II Top for a couple of days, then I returned it to the legitimate owner (my brother, who paid that card the same money I've spent less than two years ago for the 660). The case was the Antec Solo I placed under a desk, into which that card barely fits (if you have drives suspended, I bet it won't fit): long story short, I haven't noticed it to be any faster, while it draw a bit more power than the ASUS, and noise-wise I've perceived it to be more or less the same, in my opinion the MSI being slightly more noticeable at idle, while my brother felt a draw out between the two cards (I felt to perceive it over the Antec Signature 650 idle noise, while he didn't). We've also tested it in a smaller NSK3480 sitting side-by-side the monitor, and at idle it was at least as noticeable as a MSI GTX 650Ti PE: not obtrusive at all, but well perceived over a fanless card (take note that in such an enclosure the card fans are far closer to the bottom panel, and the box is less sturdy than a Solo is, so it might be a resonance or a vibration). So I said that if there isn't any straight path from your system to your hear, then more probably that not you won't notice that MSI at idle: otherwise, YMMV. Yes the MSI 270X gaming fits in the Antec Solo 1 with suspended drives, pictures to prove it are in this very thread. Although I've not tested and ASUS GTX DC II Top I do have a ASUS 7790 DirectCU II OC which I suspect have very similar fans and idle speeds. My 7790 is very quiet and quieter than my case fans (again at idle). I really don't think there's anything between the 270x and DirectCU II noise levels at idle (both very good cards). Weigh up the pros and cons of each card and go with that. I was referring to my specific setup, so I stand corrected: anyway, the one you're talking about have the MSI on the third slot. 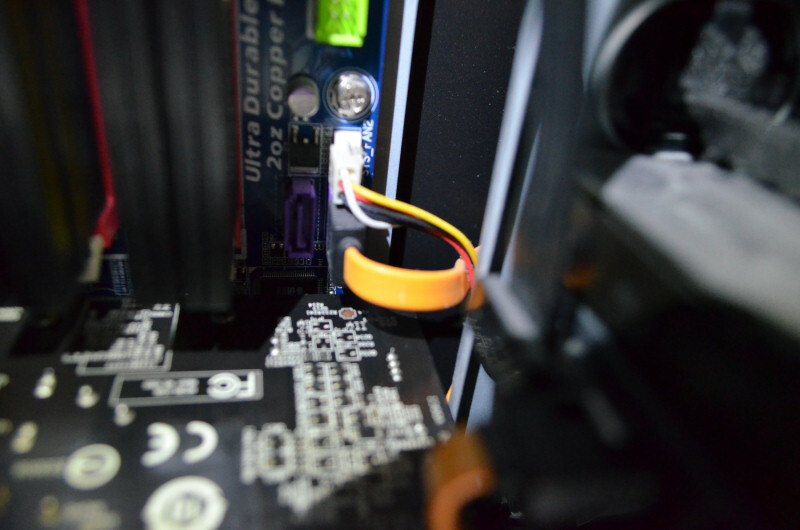 Whether it were on the second (or first) PCI-E slot, there're chances it won't fit (with a suspended drive against it). Weigh up the pros and cons of each card and go with that. I don't debate about AMD vs Nvidia, or Kepler vs. Pitcairn. My concern is all about his current passive card. IMO/IME any fanned card will be more noticeable than it, so he have just to weight this fact with reference to his current placement/setup. thanks. I'm likely to get a 2nd 7750 for some Crossfire love. Just found stock for it. The most demanding games I have are Bioshock Infinite and Hitman Absolution. Should earn me some notches up the quality settings. idle fan speed for MSI 270 (non X) is 975rpm. Now the crucial question is can the fan speed be changed, other than merely selecting from the 3 profiles? Gaming and Hawk has same fan map. Idle at 18%. I got a 2nd HIS 7750 passive. Hmmm GPU-Z 0.77 says it has a different BIOS and RAM. Made a registry change to stop Windows/atikmpag.sys from generating BSODs repeatedly on Crossfire. Guess I wont be getting a new R9 video card.